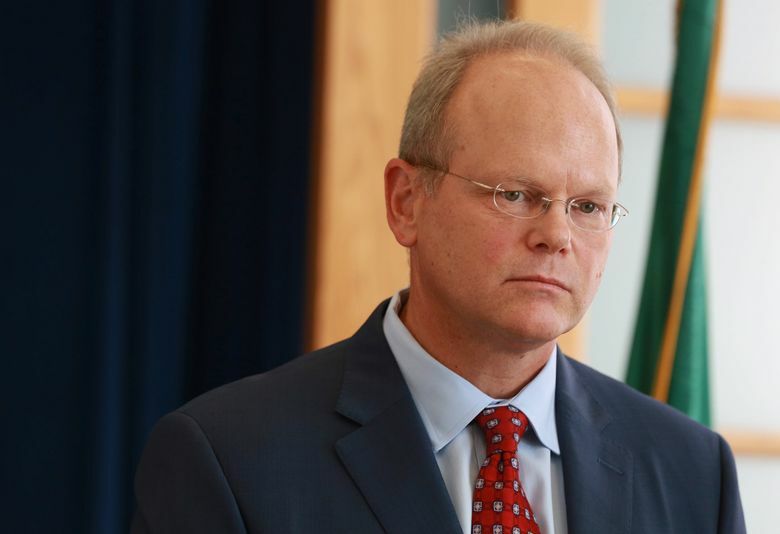 Dan Satterberg said he will urge the state Legislature to remove malice wording that has made it almost impossible to bring criminal charges against police officers over the use of deadly force. King County Prosecuting Attorney Dan Satterberg, for the first time publicly, voiced his support at a community forum Wednesday night for removing malice as a factor in considering whether police officers should be criminally charged over the use of deadly force. Satterberg said he would urge the state Legislature to get rid of the language — which makes it almost impossible to charge an officer — as lawmakers take up the hotly debated issue this year. “I intend to be involved,” Satterberg said during a wide-ranging discussion on criminal-justice matters hosted in Seattle by Not This Time, a nonprofit advocacy group formed by Andrè Taylor in the aftermath of the fatal shooting last year of his brother, Che Taylor, by two Seattle police officers. Satterberg’s remarks on the deadly force language reflected his general view and no conclusions regarding the shooting of Che Taylor, an African-American man whose death generated controversy in the community and will be the subject of a Jan. 30 court inquest. Satterberg has taken no position on the police actions in Taylor’s shooting as he awaits the results of the inquest before deciding whether the officers, who are white, should face criminal charges. The language, enacted in 1986, was the subject of a Seattle Times special report in September 2015, which described the limitation as the most restrictive in the nation and a virtual curb on bringing murder or manslaughter charges even if prosecutors concluded that an officer committed a wrongful killing. Legislation introduced last year failed in the face of strong opposition from law enforcement groups, but a task force created to study the issue voted 14-10 to recommend that the malice and good-faith language be removed. A separate push by Not This Time to eliminate the language through an initiative put before state voters failed to gather enough signatures. Taylor said another attempt might be made this year, depending on what happens in the Legislature. Satterberg said he favors retaining the good-faith language but with a definition of good faith, a position also held by the Washington Association of Prosecuting Attorneys as part of its support for removing the malice wording. But it would keep the term “good faith,” incorporating a subjective intent as part of a review versus a purely objective standard that doesn’t consider good faith. “At the end of the day, the standard will consider both subjective and objective elements, but ultimately is an objective standard because it is not reliant on the officer’s individual viewpoint — the acts can be found unreasonable,” Tom McBride, executive secretary of the association, said Thursday in an email. Taylor said he disagreed with retaining the good-faith language, because it would be defined by law-enforcement views rather than letting juries decide on the overall circumstances. Without the malice requirement, Satterberg said, prosecutors would have more leeway to bring reckless or negligent manslaughter charges where there was no intent to kill. He said criminal charges should be available in the “rare but awful” case. As the prosecutor in the state’s largest county, as well as his role as an influential leader on criminal-justice reform, Satterberg’s position could carry weight among skeptical lawmakers, particularly Republicans. Sen. Mike Padden R-Spokane Valley, told The News Tribune in Tacoma that he isn’t sure a legal change will have “that much of a practical effect” in reducing violent interactions with law enforcement. But he said he has “concerns” with the malice part of the statute and would look at the prosecutors’ language. “I think there’s a case to be made,” he said, for removing the malice clause.